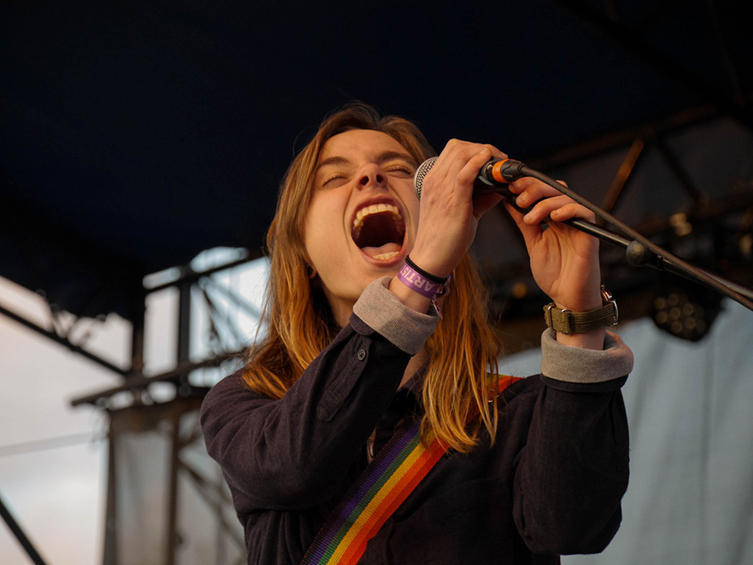 Julien Baker's heart-rending songs are as captivating as they are painful. 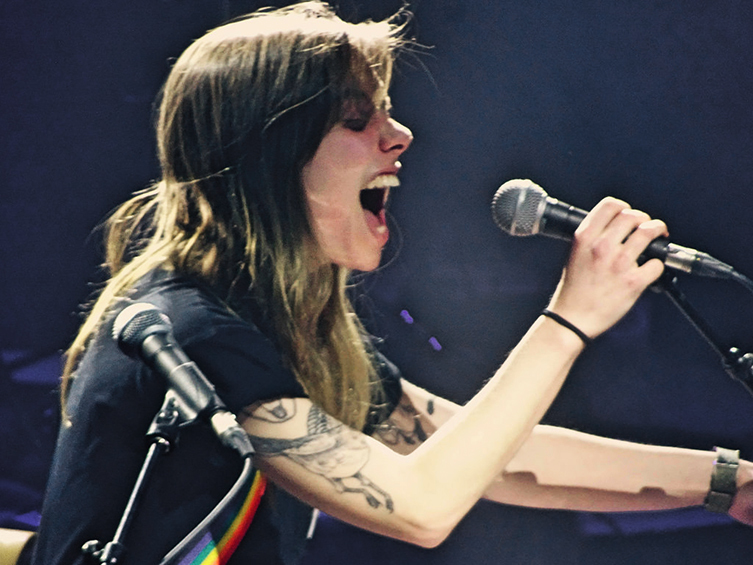 Hailing from Memphis, Tennessee, Julien cut her teeth in seminal Austin bands The Star Killers and the Forristers before going it alone, armed with just a Telecaster, a Nord keyboard, a handful of effects pedals and her gorgeously emotive voice. 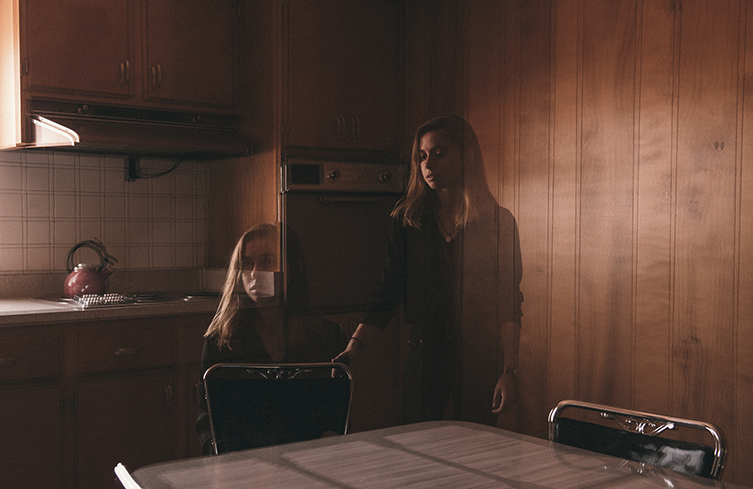 Julien's songs document the hope and despair in all its minutiae, complete with quietly innovative looping techniques and a sense of stark honesty that has won her an increasingly devoted fanbase. Julien recently toured over here in the UK and we were lucky enough to share some words together. 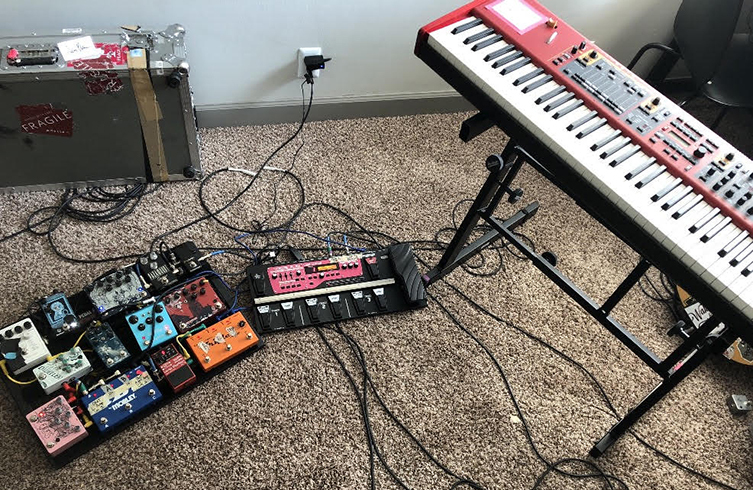 Julien proved to be a very candid, sharing interviewee, even going as far as to photograph her pedal board before AND after the tour to let us get an unparalleled insight into the workings of her bruised but sublime music. Julien, thank you so much for taking the time out to talk with us! Now, you have grown up in the musical Mecca that is Memphis: is it paradoxically harder or easier to collaborate with other musicians in Memphis? Or indeed get gigs? I think that, like with most things, it largely depends on how much time you invest. Memphis, to me, has an incredibly familial and tight-knit arts community. I think that loyalty is a very strong characteristic of Memphis, the relationships formed within that community are very strong-- However, that also makes the scene a little bit more insular. I think that because it is a smaller scene it isn't as sectarian, which makes it more diverse, but because it isn't as large as other cities like Nashville and Atlanta, it's a little bit more difficult to get plugged in. I find not as many tours make stops in Memphis, because it's smaller, the venues and the topography of the city have been in a state of flux and without a really intimate knowledge of the city it can be challenging. Now I live in Nashville, and it's hard to feel like I am staying aware of how the musical community there is evolving. Whereas a city like Nashville seems to be more superficially inviting and provide more entry points, I think Memphis, while tougher to crack, is a bit more cohesive. There are benefits to both, its the personality of those cities. When you started out on your own after Forrister (I will namecheck The Star Killers and the Forristers in the intro), how did you get your name out there? What kind of self-promotion did you do? When I first released Sprained Ankle, I was doing hardly any self-promotion at all; I was still touring with Forrister and that was my main gig. I released the record on bandcamp, posted about it on facebook for my friends, but I wasn't actively trying to shop the record or anything. I had a relationship with a long-time friend and show booker in Memphis who played in a couple bands who showed my record to his friends and people he worked with, and from there 6131 approached me about re-releasing the record. I think that's the lesson that I try to take from how my musical career has developed: that the relationships and genuine interactions I had were just as important, if not more important, than any overt, explicit self-promotion I was attempting to do. After I started working with 6131, we hired a publicist and a booking agent. Both those people were able to put my music in front of more people, but at the end of the day, we chose to work with people who were not trying to manipulate or market, they were just giving a platform to music they authentically enjoyed; those are the kinds of partnerships that I have always found are far more fruitful, those based on genuineness. The point I am trying to convey with all of this is that what I believe is far more important than self-promotion is to be genuine and dedicated. I think that when you pair the practice of being kind, respectful, and honest with the willingness to be patient and dedicated to your craft, it will make you far more successful-- and happy-- in the long run. What have been the more demanding parts of being an artist on the way up? The most demanding part of being an artist, for me, is the challenge in finding a balance of touring and home life. I've toured since I was a teenager and getting to travel and play shows is one of the most rewarding experiences of my life, but as I have transitioned from part-time to full- time touring, I have had to become more and more intentional about staying present and engaged in the lives of my loved ones, sustaining friendships and long-term relationships takes more effort, more patience, and make me have to be precious with my time and attention and constantly aware of how I'm giving that to others. Fortunately, I am generally surrounded by amazing, loving people who are willing to take on that challenge with me, and I'm very appreciative of that. You are currently in the middle of a European tour, with lots of US dates to follow: how do you find touring? Can you write whilst on the road? Well, actually I have recently just made it back home to Nashville (again, so many apologies about the delay!). But to answer your question: yes, I write a lot while on the road, partially because I am on the road so much that I sort of have to be able to, partially because writing is something that happens automatically for me. I write articles--essays, album reviews-- for a couple publications and those have fixed due dates, so I am usually working on one or two of those while on tour. But I am always writing songs and poems because I think that is how I interact with and digest the world, so most of my experiences are sifted through a musical or a poetic lens. I record or write down pretty much every idea I have; most of it never ends up becoming anything, but every once in a while it turns into the skeleton of a song I can work with, and then I end up with tons of unfinished songs that I can go back and refine later. In terms of songwriting, are you constantly writing, or do you set aside chunks of time to specifically sit down and write? I try not to confine the songwriting process to a specific time, sit down and say "I will now write a song." For some, that is helpful and motivating, but for me, I get performance anxiety and all the ideas immediately flee my brain. Instead, I try to practice making myself constantly aware, I try to remain curious and engaged, go through life preserving the sensitivity that allows us to recognize the poetic aspects of our every experience. So that when something moves me, when something is beautiful or heartbreaking or angering, etc., I can take that feeling, write it down, try to express it in poetic or musical terms. And then the stuff of songs starts to pile up. Once all of these fragments have gradually accrued, I can collect them all and shape them into final versions of songs, and then carve out specific time to work with their arrangement, but that comes much later. The initial process is very organic and slow. When writing, how much of what you write makes it to the final record? I would say about 30 percent or less of the songs I write end up becoming recorded final versions of songs. But-- that's part of the process! Expelling everything and then sifting through to find the best parts. What kind of things are you trying to communicate with your music? Can music be like therapy sometimes? Like a catharsis? I do think that music can be like therapy, I think that all music gives us a sort of catharsis; We most often discuss catharsis in regards to sadness or pain, but music provides us the ability to experience this sort of emotion-by-proxy that can help us express not just our sadness, but our anger, fear, even joy or confidence that we don't otherwise allow ourselves to feel. As far as what I'm trying to communicate with my music, I have often felt torn about whether to attach a specific agenda or thesis to my art. On one hand, I do feel a responsibility to address the questions and themes that I find salient and urgent. However, I have found that (at least in my estimation) the most impactful and meaningful art is the art that holds honesty as its highest value and tells a story that is personal to the creator. I think that the way to keep discussions of politics, faith, morality, and the like from seeming detached, dull, or artificial is to anchor them in personal, human experience. Sometimes I feel that I should be more explicit in my writing because of a sense of social responsibility-- but I think that these themes can be represented in so much more of a nuanced, approachable way when they are embedded in a narrative of personal experience. Which is why rather than try to unfold a philosophical treatise in a 3 minute song, I continue to write songs about my friends, my family, the minutiae of relationships and the anxieties of day to day life, because I believe that the practice of honesty and vulnerability in music can incite conversations that might include some of those macro-level concerns, give us perspective and help equip us to deal with them. A lot of your music, to us, is a juxtaposition of beauty and melancholy. Would you say that is accurate? And would you say it’s important to have both elements in your songs? That is a very poetic, and flattering, way to put it! Thank you. I think that it is not so much that it is important to me or that it is a conscious decision to mix or balance beauty with melancholy, but that those things naturally cohabit the same space, that they are not mutually exclusive to each other. Our emotions are seldom one-dimensional or clear, and I think that often when you discuss a beautiful thing, it's impossible for it not to have some elements of melancholy. Conversely, I think that when I discuss pain, it is hard to do so without feeling the natural inclination to recognize the beauty or hope that resides within it. When you’re writing, how do you keep a record of your ideas? Do you record rough bits and pieces into your phone? I do everything-- I have a stack of journals, I keep notes and voice memos on my phone, when I'm home I make amatuer demos on Logic. It gets a little disorganized, but I find having multiple mediums of working through the ideas helps the process. Let’s talk guitars! You seem to prefer Fender telecasters over other electric guitars: what is it you like so much about them? I do! I feel very comfortable with teles. I think I initially started playing a Telecaster because they were versatile and straightforward, and I kept playing them because after so long I was very familiar with the personality of that guitar model, and I felt most adept at playing when I could play something that I was well acquainted with. Do you have particular Telecaster models you prefer? I play both a thin-line semi-hollow and a solid body telecaster, I don't necessarily prefer one to the other, I just use them for different sounds; The semihollow body is a little thinner but more resonant, the solid body is a little beefier of a tone. But they both have incredible sustain and retain a really warm sound, which is what I like about classic telecasters. I have never been as partial to the deluxe telecasters with humbuckers, because I think one of the most attractive qualities about the tele is its delicacy and responsiveness and they just feel a little aggressive. The one telecaster I have with a soap-bar pick-up looks like it has a classic p90 but its actually a G&L pickup that is a lot less hot. On my main telecaster, I rewired the switch with a mod that allows you to choose whether the two pickups run series or parallel, which I love because it widens up the spectrum of how warm or bright the guitar can sound and gives it a lot of versatility for me. What about amps? What do you look for in a good amp to gig and record with? I typically record on a Fender Blues Deluxe or a Fender Twin Reverb-- again, both of those help me achieve very different tones so which one I use in the studio depends on the tone I am trying to achieve. The Twin is very bright, the Deluxe is a lot more damp and mid-heavy to me. Live, I use both a deluxe and a twin at the same time in stereo and blend the two sounds. One of the things that we noticed about your music early on is your inspired use of effects, especially ambient effects and loopers. What drew you towards effects? 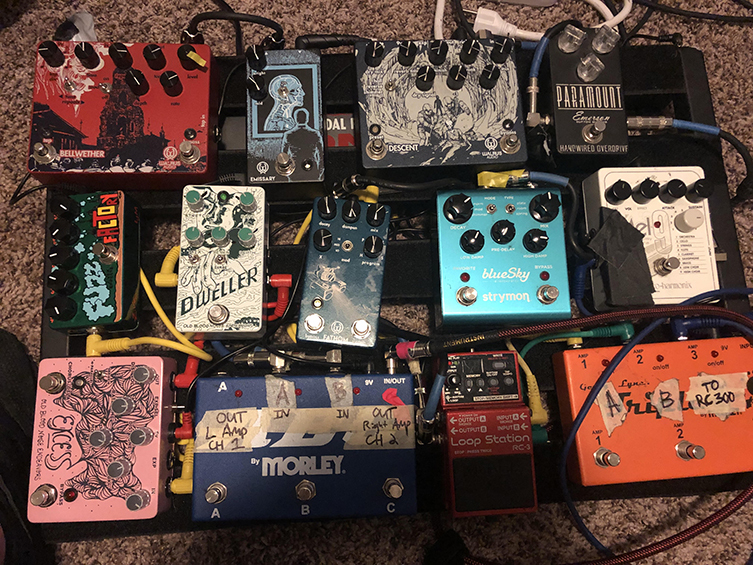 I think that pedals seemed like one of the most straightforward and immediate ways to open up new possibilities with sound. I was fascinated with the way that playing with knobs and buttons and manipulating parameters could change the sound so much. But, I think it also took me a while to learn when there is too much going on, how to not use effects as a crutch of tone or a gimmick instead of focusing on becoming a better player or songwriter-- I think it is great to be able to create really interesting and beautiful sounds but also so necessary to have a foundation of tasteful playing. So, I'm constantly going through phases where I find myself acquiring all this gear and then have to do a purge to eliminate the non-essential stuff that is maybe cluttering or distracting, get rid of anything that is impeding or isn't serving the music, I guess. What is currently on your pedalboard just now? Okay, I feel hypocritical having said the whole bit about knowing when to simplify because my effects chain is a bit of a maze right now. So basically I send my guitar in, through all my FX processing, and then I split the signal 3 ways. One line goes mono into a massive board containing tracks and pads that I've built, I record new tracks live over those existing tracks. (my Nord also runs into the RC 300 so I can make piano loops). The other two lines run in stereo into the RC-3, come out stereo, and get sent out individually from the second Morely tripler. I did this as sort of a round-about trick to allow me to have two separate loops going concurrently on the same device (the RC-3) that I am able to control separately. So, I can have a rhythm and a lead part, and I can drop either one in and out while the other keeps going, but since they're happening on the same track, they remain synced tempo-wise. The only drawback of this system [besides being extremely over complicated] is that I haven't figured out how to get the master clock of the RC 300 to control the RC-3, I don't think it can without a midi in. So, if I want to use both loopers at the same time I just have to be very precise in the execution, which is kind of nerve-wracking on stage. But- with the amount of tap-dancing I do between all the pedals, it's all pretty nerve-wracking. I really hope that makes sense so it's not just a bunch of babble. I attached two pictures, one is before tour and the other after tour, so there might be a few discrepancies but the gist is there. No, you've explained it very eloquently, thank you! Would we be right to assume that the delays and loopers play a role in the compositional process? Sometimes yes and sometimes no - on Sprained Ankle, I was experimenting a lot with stacking loops and using that as a way to fill up the sonic space when I was writing alone, and that was partially true of Turn Out The Lights. But, on Turn out the Lights I also wrote many more piano-based songs because I was living in a space where I could play the piano frequently. Now, I write about half the time just on acoustic guitar, half the time with the whole rig set up. 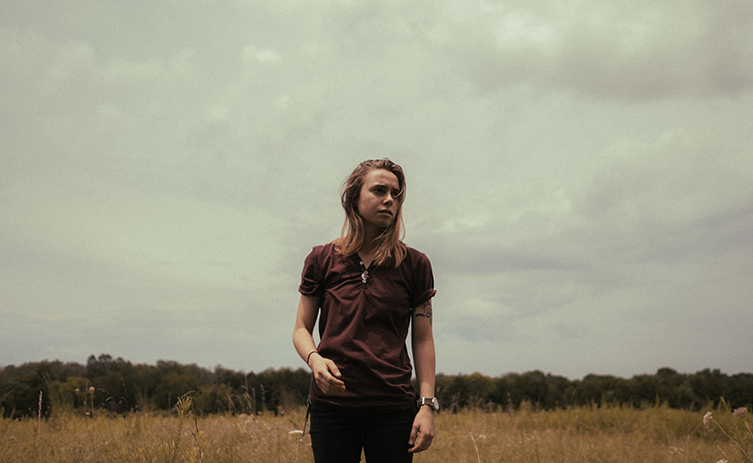 And, when I'm on the road, I will edit songs down in the van, and the ability to play with production also really impacts the writing process. What bands or artists are you into yourself? Some of my all-time favourite artists are Death Cab For Cutie, mewithoutYou, and Pedro the Lion, those are artists I listen to quite a bit. Right now as far as new stuff I'm listening to a variety of stuff! Paramore's After Laughter and SZA'a Ctrl are a couple of recent records that feel classic already... 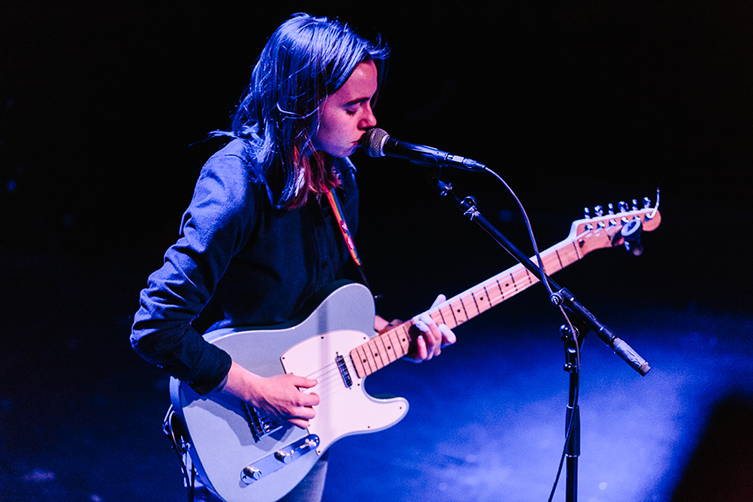 This year, the new Mitski record is incredible, as is the new Kacey Musgraves record. I've also been really digging the new Brockhampton record. After this tour is done, what is next for you? In November, Phoebe Bridgers and Lucy Dacus and I are all going on tour together and performing some boygenius tunes as well, and then after that, I am going to take a big step back from touring so heavily and probably work more on writing. Finally, as someone who is out there as a successful touring and recording artist, what advice would you pass on for anyone looking to make a go of it in the music business? I would just say to be genuine-- above all else. To try to form honest and meaningful relationships with people. Think of people as people, not as what they can do for you or what resources they have access to. Remain as humble as possible. Know what you are worth but never become too jaded to appreciate a blessing or so entitled you expect it. And play as many shows as you can. Meet as many people as you can. Support as many artists as you can. But not because one of those artists might be a rung on a ladder to success, because each one of those artists is a person worthy of being valued. That is some beautiful advice, Julien. Thank you so much for talking to us and best of luck with the November tour and your future writing! You can find out more about Julian from her Facebook page here and from her website here. We'd like to thank Julien for talking to us and also Noam from Matador records for kindly setting everything up.